Go to "Site administration / Advanced features" and enable "Networking". Go to "Site administration / Plugins / Authentication" and turn on "MNet authentication". On 3.3 and master, turn "OAuth 2" as well. Under "Common settings", make sure that "Self registration" is disabled. Go to "Site administration / Networking / Manage peers"
In the services tab, check all boxes. Check the Mahara login button and the OAuth2 login buttons (if on 3.3 and master). Confirm that the buttons look nice and consistent with the Clean theme. Confirm that the buttons are centre-aligned just like the login button. Go back to "Site administration / Plugins / Authentication"
Set "Self registration" to "Email-based self-registration"
Log out and go back to the login page. Confirm that the buttons are centre-aligned in the "signuppanel" div just like the "Create a new account" button. Turn editing on and add the login block. Logout and go to the site home where the login block is. Make sure you're using Boost theme. Confirm that the buttons look nice and consistent with the Boost theme. Note: Test on Clean Purge caches. Log in as admin. Go to " Site administration / Advanced features " and enable " Networking ". Go to " Site administration / Plugins / Authentication " and turn on " MNet authentication ". On 3.3 and master, turn " OAuth 2 " as well. Under " Common settings ", make sure that " Self registration " is disabled. Go to " Site administration / Networking / Manage peers " Add a Mahara host: Hostname: https://demo.mahara.org Application type: mahara In the services tab, check all boxes. On 3.3 and master, set up one or more OAuth2 services (e.g. 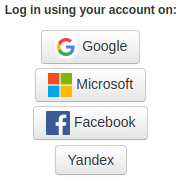 Facebook, Google, Microsoft) Log out. Go to login page. Check the Mahara login button and the OAuth2 login buttons (if on 3.3 and master). Confirm that the buttons look nice and consistent with the Clean theme. Confirm that the buttons are centre-aligned just like the login button. Login as an admin Go back to " Site administration / Plugins / Authentication " Set " Self registration " to " Email-based self-registration " Log out and go back to the login page. Check the Mahara login button and the OAuth2 login buttons (if on 3.3 and master). Confirm that the buttons look nice and consistent with the Clean theme. Confirm that the buttons are centre-aligned in the " signuppanel " div just like the " Create a new account " button. Login block Login as admin and go to the site home Turn editing on and add the login block. Logout and go to the site home where the login block is. Make sure you're using Boost theme. Check the Mahara login button and the OAuth2 login buttons (if on 3.3 and master). Confirm that the buttons look nice and consistent with the Boost theme. Switch to Clean theme. Check the Mahara login button and the OAuth2 login buttons (if on 3.3 and master). Confirm that the buttons look nice and consistent with the Clean theme. I have noticed the IDP list on the login page using clean theme looks ugly. We should try to let it as close to boost we can.